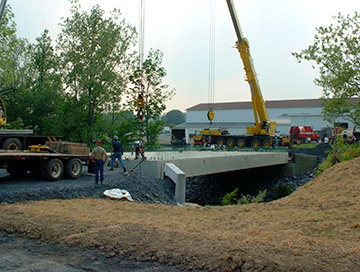 In 2003, the Borough of Northampton retained Hanover Engineering to design and oversee the construction and contract administration of a new bridge over the Hokendauqua Creek to serve an existing industrial park. The bridge was constructed as part of a new roadway to provide an alternate route for heavily loaded recycling trucks in order to reduce the burden and impact on the existing, older bridges and roadways in the area. This alternative route also provided a safer, less congested route greatly benefitting the local community. The bridge was designed as a single span, simply supported precast prestressed concrete bridge. The bridge girders spanned over 100 feet from bearing to bearing with a 48-inch by 48-inch box section. Hanover Engineering also provided the design of the bridge abutments, as well as surveying services for design, construction stakeout, and right-of-way acquisition. In addition, Hanover Engineering assisted the Borough in obtaining all environmental permits required for construction, including a waterway encroachment permit and erosion and sediment control approval. Throughout the construction of the bridge, Hanover Engineering provided inspection and administrative services and responded quickly to the needs of the Borough and contractor as issues arose during the course of the project. The project was completed on budget and within the time frame provided for the project.